Game description: Now you can play blackjack, video poker, and slots--no matter how close or far you are from Las Vegas. 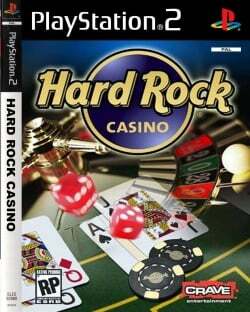 Hard Rock Casino combines the most popular casino games in one package, complete with realistic cards and casino gameplay. Each game includes help files and supports familiar keypad controls. In this authentic casino simulation, you can develop your skills and strategies and increase your winnings to become a casino master. Become a high stakes roller at The Hard Rock Casino! Challenge your luck at over 20 different casino games including Black Jack, Roulette, Craps, Pai Gow, Let It Ride, Texas Hold'em and more. 4 uniquely themed casinos, each with different house rules, table limits and games. Hits a TLB miss after pressing X to continue. USA v02.20(10/02/2006), Activate the automatic gamefixes. This page was last edited on 18 November 2016, at 16:53.